Mountain bulin snail (Ena montana). Picture: © Stefan Haller, (schneckenfoto.ch). Mountain bulins live in humid deciduous and alluvial forests. Bulin snails are small to averagely large terrestrial pulmonate snails with a high conical to cylindrical shell. The apertural rim shows a lip and often is strengthened by an apertural armature of several teeth. While the shell of most native Enidae is coiled to the right (dextral), there is also the four-tooth bulin (Jaminia quadridens), whose shell typically is coiled to the left (sinistral) (see below). 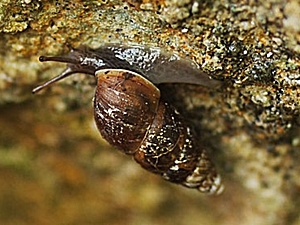 The species in this family are forest snails, they live on trees, in dry areas as diggers in the ground or on rocks. They feed on wilted plant parts and detritus. Some species also camouflage their shells with faeces and detritus stuck on the shell's surface. The formerly used scientific name Buliminidae Clessin 1879 is preoccupied (the Buliminidae are a family of Foraminifera), so the younger name Enidae Woodward 1903 would be correct, as it would also include the former type genus Buliminus. Animal Base: Enidae family homepage. Description: The mountain bulin's shell is conical and pointed with relatively flat whorls. The shell surface is grained to form a grid-like pattern. In contrary to the rest of the shell coloured light or dark brown with a sometime bleached tip (apex), the aperture rim is pale rose coloured or white. The aperture rim sometimes is folded back to form a lip, but is missing at the aperture's upper (parietal) side. Instead there is a whitish layer, a so-called callus. 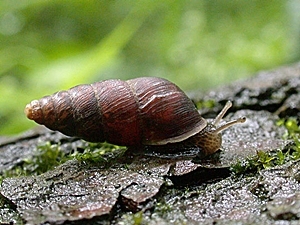 The snail's body is dark to violet brown with dark spots on the upper side. 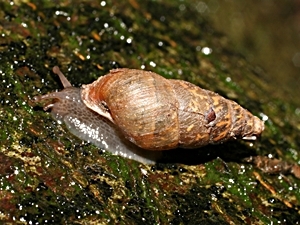 Juveniles of the mountain bulin sometimes camouflage their shell with faeces and earth. Dimensions: H: 14 - 17 mm; W: 6 - 7 mm; N: 7 - 8. (Abbreviations). Habitat and Distribution: The mountain bulin inhabits humid deciduous forests in hill and mountain country. While the species appears on limestone ground in the south of England, in Central Europe it is a characteristic species of alluvial forests. In Switzerland the mountain bulin is found up to an altitude of 2500 m MSL, but rarely lives beyond the tree line. Ena montana lives on wilted and decaying plant matter, on humid days it climbs rocks and trees, like some door snail species do. The mountain bulin is distributed all over Central Europe, in the east as far as central Russia and the Carpathians, in the west as far as eastern France. In isolated populations, it also appears farther west, in the Pyrenees, western France and southern England. Animal Base: Ena montana species homepage. Description: The lesser bulin is similar to its larger relative in form and colour of the shell, but it is noticeably smaller. The shell's surface is not grained, but densely striated. The aperture rim is equally folded back and of whitish colour, but Merdigera obscura lacks the white parietal callus. 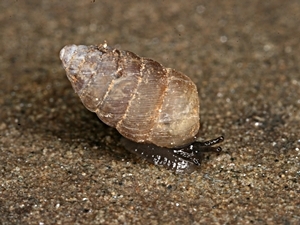 The snail itself is coloured dark brown, with lighter sides and bottom. The smaller tentacles have about one quarter the length of the longer tentacles, which are quite long. 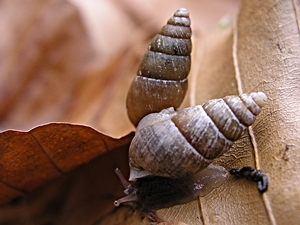 When crawling, the snail carries its shell very high and only tilted very little to the right. 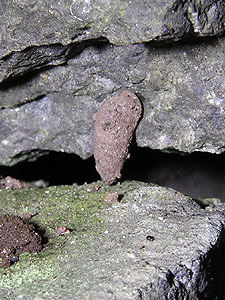 As the snail's genus name (the "excrement-bearer") already states, juveniles and adults of this species often are hidden beneath a camouflage of dirt and faeces. Dimensions: H: 8.5 - 10.5 mm; W: 3 - 4 mm; N: 6. (Abbreviations). Habitat and Distribution: The lesser bulin is less in need of humidity as its larger relative. So it is found in deciduous forests, on tree trunks and under leaf litter, but it also appears outside of forests, under stones, on walls, in the ground litter and on moss. In humid weather especially the young crawl up tree trunks and rocks. The species' distribution area stretches from North Africa over almost all of Europe, as far as southern Finland. 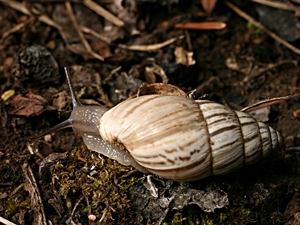 In Switzerland and Bulgaria the snail can be found in altitudes of up to 2000 m MSL. Animal Base: Merdigera obscura species homepage. In comparison: A dextral shell of the three tooth bulin (Chondrula tridens, on the left) and the only native sinistral species, the four tooth bulin (Jaminia quadridens, on the right). Pictures: Helmut Nisters. Three tooth bulin (Chondrula tridens). Description: The three tooth bulin has an almost oval shell with a conical tip (apex). It is noticeably coiled more densely than the previously described species. The whorls are slightly rounded outside, shining mattly and of a greyish brown to horn brown colour. The apertural rim is slightly thickened and folded back to form a lip. As in Ena montana. there is also a parietal callus. In the aperture there are the three teeth which give the snail its name: The parietal lamella (see also aperture armature in door snails) is well visible in the aperture. Chondrula tridens, as well, camouflage their shell with faeces and earth. Hartmut Nordsieck: Clausiliidae I: Scientific terms concerning the aperture armature, among other things. Dimensions: H: 9 - 14 mm; W: 3.8 - 4.5 mm; N: 7 - 8. (Abbreviations). camouflage colour on a rock. Habitat and Distribution: The three tooth bulin is a characteristic steppe species, which lives on sunny calcareous and steppy slopes in warm areas. Usually it lives in the ground near the rocks and only comes outside, when the weather is warm and humid. In Switzerland the species lives up to an altitude of 1500 m MSL, in Bulgaria up to 1500 m MSL. In the remaining Alps the species may even climb as high as 2200 m MSL. Chondrula tridens lives on died plant parts. Chondrula tridens's distribution area stretches over the European Mediterranean, from the Balearics, south-west France and Italy (missing on Sardinia) as far as Central Europe, Lithuania, Central Russia, the southern Ural mountains, South-Eastern Europe (Bulgaria), Turkey and the north of Iran. In Germany and Switzerland the species is endangered (EN). Reischütz, P. L.: Beiträge zur Molluskenfauna Niederösterreichs, XII. 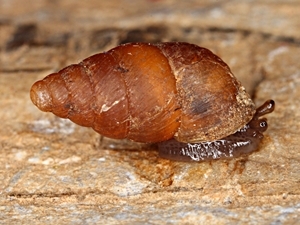 Zum rezenten Vorkommen von Chondrula tridens (O. F. Müller 1774) (Gastropoda: Pulmonata: Enidae) in Ostösterreich. Animal Base: Chondrula tridens species homepage. ting on a grass stem. Description: The large bulin or zebra snail is the largest of the native bulin species. Its shell is widely oval with a blunt tip, almost smooth and shining. 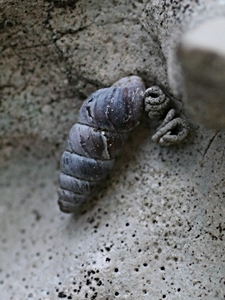 The shell with its firm wall is opaquely white, hint towards the fact that this is a warmth-loving species. There are dark stripes running across the whorls, giving the snail its zebra-like appearance. But those stripes can also be missing so the snail is purely white. The snails actual body is coloured yellowish grey to light grey. When the temperature decrease in autumn, it becomes darker, with increasing temperatures in spring it returns to its former light colour. Zebra snail (Zebrina detrita). Picture: © Alexander Mrkvicka. Dimensions: H: 12 - 30 mm; W: 8 - 12 mm; N: 6¾ - 7. (Abbreviations). Habitat and Distribution: Zebrina detrita, as already mentioned, is a warmth-loving spec. It lives on the meadows of warm and dry slopes, as well as in rocky steppes on limestone ground and in vineyards. The snail is described as sociable, it does appear in large numbers. In the Alps it climbs to an altitude of up to 1600 m MSL. The distribution area of the zebra snail covers Europe from south and south-east France over southern Germany and the Czech Republic as far east as Hungary, Bulgaria and Turkey. In southern England there are also smaller populations. In Germany the northern limit of zebra snail findings is about a the latitude of the Harz mountains. Until now, the zebra snail has also been introduced to other regions. 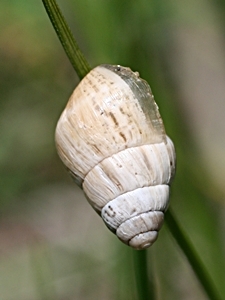 Zebrina detrita is one of the possible intermediate hosts to the lancet fluke (Dicrocoelium lanceolatum), as does, for example, the western heath snail (Helicella itala). In the Kaiserstuhl (emperor's chair) hills near Freiburg in South Baden, warmth-loving (xerothermous) snail species are found, appearing almost nowhere else in Germany. Terraces built for viticulture on the loess ground rich in nutrients and limestone have produced new biotopes here. The introduction of xerothermous Mediterranean species is not necessarily a modern development, though. It has happened in different periods of history: At the Kaiserstuhl, Zebrina detrita is found the first time in loess layers from the late Bronze Age, as is the round mouthed snail (Pomatias elegans). Threat situation: The zebra snail is especially threatened by the changes and destruction of its habitats by agriculture, for example by the cutting of grass. Because the species occurs in a disperse manner in isolated places (though sometimes in large numbers), it is particularly susceptible to habitat changes. Therefore, in Austria and Bavaria, Zebrina detrita is classified as endangered (EN), in Switzerland as vulnerable (VU) (see: IUCN Threat Categories). Francisco Welter-Schultes: Zebrina detrita species homepage. Lais, R. et al. : "Die Mollusken", in: "Der Kaiserstuhl - Eine Naturgeschichte des Vulkangebirges am Oberrhein", Bad. Landesverband f. Naturkunde u. Naturschutz, 1933, S. 366 ff.